WHY CHOOSE US TO PROMOTE YOUR BUSINESS? The British Columbia Adventure Network (www.bcadventure.com) is BC's undisputed leader in Internet travel and tourism promotion since 1997. Over a million web visitors per year rely on us to plan their BC vacations! We will deliver to your business pre-qualified customers who are actively planning their next BC vacation. We reach travellers from over 103 countries, providing you affordable access to new markets with a steady and proven stream of potential clients. We provide these travellers with more than 7500 pages of travel info - BC's largest and most comprehensive travel planning resource. We are consistently rated at or near the top of search results on the leading search engines. The BC Adventure Network is a private BC tourism marketing network consisting of a portfolio of nine award winning BC travel websites and ten digital travel publications. We were established in 1997, by the Interactive Broadcasting Corporation, and are BC's largest and most visited privately owned tourism web marketing group. We welcome over a million visitors to our websites annually, each actively planning BC vacations. From these visitors, we deliver pre-qualified leads directly to your website for about $50 per month. We offer advertising on our network of 9 BC travel information sites. Our flag ship website and the one that started it all. BC's largest travel & tourism site. 2. DISPLAY AD & BANNER SATURATION CAMPAIGNS. Your choice of sizes and formats in our flag ship site BC Adventure (www.bcadventure.com) or larger display ads in our 8 vacation-specific sites (i.e. 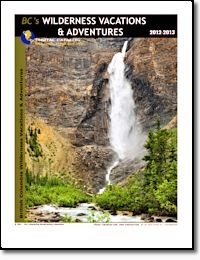 : www.travelbritishcolumbiacanada.com). (CONTACT US for details of banner and display advertising). Have your Website created by our award winning design team and hosted on a state-of-the-art server. We would be pleased to quote on a complete package that will include custom design, hosting and advertising. We create WordPress empowered, mobile friendly websites and Social Media sites. If you like a quote on an affordable website, and examples of our work, please let me know. Let us host your Website. Whether it's your primary site or a fully functioning alternate site, we offer powerful hosting solutions. Each hosted site comes complete with an advertising package that gives you access to our audience of BC tourist visitors and the full privileges of a BC Adventure Membership. IBC is pleased to offer competative quotes on any of these custom services. Put our award winning design team to work for you. BC Adventure Corporate members enjoy a preferred rate. Bring more visitors to your Website! We have years of experience and a proven track record of improving our clients standings with the popular Internet search engines. We have been offering Web-based marketing services to hundreds of BC tourism operators, large and small, for many years. We try our best to anticipate your needs and deliver a premium service. Most of our clients have been with for many years. We consider them part of our family, and we welcome the opportunity to serve you, too. If you have any questions, please give me a call or drop me a note. Again, thank you for your interest.